Joinery was the initial driving force when Deep in Wood was first established. 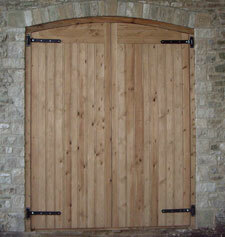 We were recently commissioned to create a bespoke matching pair of Oak gates for Sunningwell Church near Abingdon. We have also carried out joinery work for numerous barn conversions where everything has been fully customised for the project. Although Deep in Wood now offers other services joinery is still an important part of its growth and therefore we are still prepared to create doors and other joinery products to your specification.